In the Southwestern mountains of Africa there are still a few Mountain Zebras. They are the only species of zebra that don’t constantly live near a freshwater source and while the various species of zebra may seem identical for a non-specialist, they’re actually as closely related to each other as they are to horses. These animals reach a height of up to 120 cm and a length of 2,2 metres. 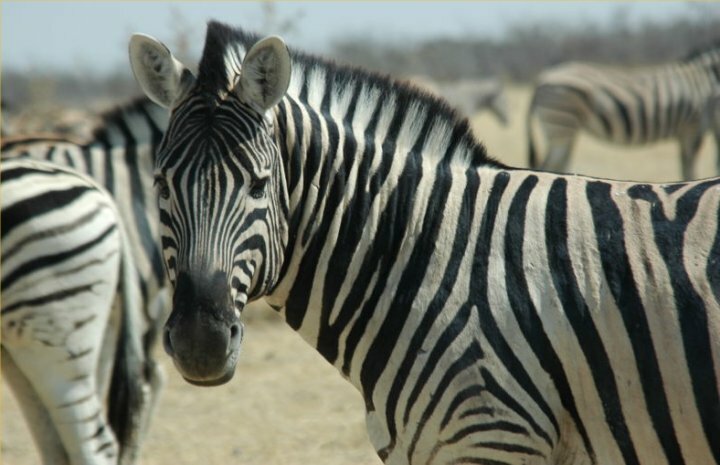 If not for the stripes, a zebra would look very similar to other horse species. Even know, the use of the stripes is unknown – they were first believed to serve a purpose of camouflage, while nowadays more common is the opinion that the stripes serve a means of identification of individuals, as the pattern of the stripes is unique for each specimen, just like a human fingerprint. A distinguishable Mountain Zebra feature that sets it apart from other zebra species is that the black lines are considerably thicker than the white. These zebras live in small family herds, often living next to antelope groups. Mountain Zebras are valuable companions for antelopes, because of their heightened senses, allowing to spot predators much faster. As the animals eat different kinds of food, they don’t have to compete. The Mountain Zebra herd is made up of one mature stallion, one to six mares and their calves. The group is lead by one of the mares, while the stallion always walks behind or on one side of the herd, ensuring safety. The Mountain Zebra, much like other horse species, feeds on grass. Also, sometimes chews tree bark, and eats sprouts, leaves and fruits. This animal has adapted very well to the unpleasant hot and arid climate – this zebra can live for up to three days without drinking water. Most of the day is spent grazing and monitoring the surroundings, in fear of possible predators. The mare is ready to mate multiple times a year. Copulation is done with calculation that the calves are born in the rain season when food is abundant. After an almost year long pregnancy, one (rarely two) calf is born, who can already walk in one hour. For almost a year the young Zebra drinks the mother’s milk. Two years after birth, they have become mature. Young males are driven out by the dominant stallion, but young females can stay with the group or form a new one. African farmers consider the Mountain Zebra a pest, because they compete with livestock for grass. 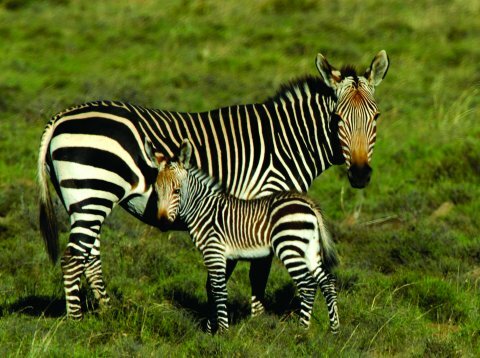 Therefore, a bounty was issued for every zebra tail and one subspecies of the Mountain Zebra reached a critical population of only 27 individuals. Currently, the future of the Mountain Zebras is unclear – even though hunting has ceased and they’re protected by laws, it’s unknown whether their population is increasing.